This recipe comes from Gourmet magazine. It's known as Elvis Presley's Favorite Pound Cake. Now, I can't attest to whether or not "The King" ever ate this cake, but I do know that it's a firm favorite of mine. 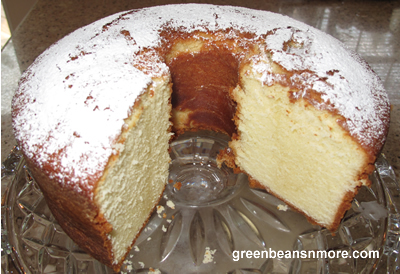 This pound cake recipe is the recipe that I've been searching for. I've made lots of homemade pound cakes in my time and have never achieved this level of pound cake nirvana before. This pound cake is everything a pound cake should be, moist and buttery flavored with a perfect dense velvet like texture. Best of all this cold oven cake recipe is quick and easy to make. I recently made this pound cake two times within one week - for two very special birthday celebrations. Not only did it turn out absolutely perfectly both times, it also received RAVE reviews for it's taste. I'd suggest you make this cake a day ahead of time as the buttery flavor seems to intensify and it seems to get more moist and dense when it sits.